Today is Tuesday, December 6, the 341st day of 2016, with 25 days remaining. There are 15 days until the winter solstice, 17 days until Festivus, 18 days until the start of Hanukkah, 19 days until Christmas Day, 45 days until Donald Trump becomes president of the United States, and 700 days until the November, 2018 mid-term election. 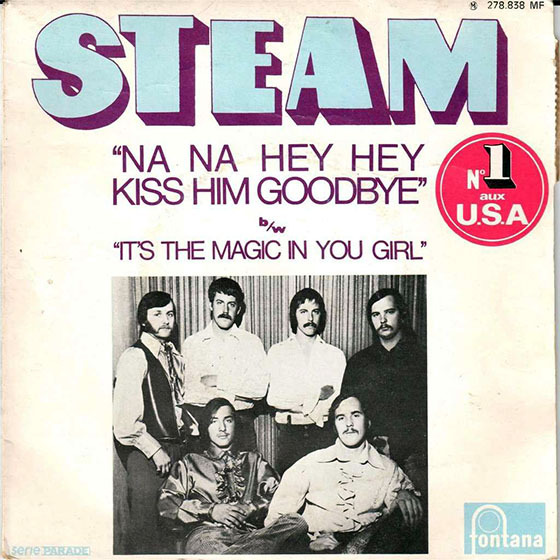 On this date in 1969, the song "Na Na Hey Hey Kiss Him Goodbye" by the then-fictitious band "Steam" started a two week run at number one on the US singles chart. The song was actually recorded by Gary DeCarlo, who intended it to be the "B" side of his first single. Gary didn't like the song and when record executives wanted to issue it as the "A" side, he insisted it be released under an assumed name. The also song became a UK Number 5 single for girl group Bananarama in 1983. Among other things, today is also National Gazpacho Day. Gazpacho is a soup made of raw vegetables and served cold, originating in the southern Spanish region of Andalusia. Gazpacho is widely eaten in Spain and neighbouring Portugal, particularly during the hot summers, as it is refreshing and cool. Why is it celebrated in December? Hush, and eat your soup. Drunk Florida man denied tacos, calls 911. As of this writing, The KGB Quotations Database contains 42,535 entries. Check it out. Steven Wright, American comedian, actor, writer, and an Oscar-winning film producer. Quote of the day: "You can't have everything. Where would you put it?" Go easy on the protein. Several large observational studies have linked high-protein diets with an increased incidence of cancer, heart disease and other ills... one study found that those who ate a high protein diet between the ages of 50 and 65 were four times more likely to die of cancer than those who consumed less protein. Also on today's Wheel of Health, "People consuming at least 20 grams (7/10ths of an ounce) of nuts daily less likely to develop potentially fatal conditions such as heart disease and cancer. Maybe. Researchers cannot prove nuts are the sole cause of these outcomes. The Constitution lets the electoral college choose the winner. They should choose Clinton. The framers believed, as Alexander Hamilton put it, that "the sense of the people should operate in the choice of the (president)." But no nation had ever tried that idea before. So the framers created a safety valve on the people’s choice. Like a judge reviewing a jury verdict, where the people voted, the electoral college was intended to confirm- or not- the people’s choice. Electors were to apply, in Hamilton’s words, "a judicious combination of all the reasons and inducements which were proper to govern their choice"- and then decide. The Constitution says nothing about "winner take all." It says nothing to suggest that electors’ freedom should be constrained in any way. Instead, their wisdom- about whether to overrule "the people" or not- was to be free of political control yet guided by democratic values. They were to be citizens exercising judgment, ?not cogs turning a wheel.